A entry in a book event, unlike a book review, makes no claim to completeness, finality, or even to treating the book under question directly. Consider yourself warned, because what I’m posting is a less-cluttered version of the marginalia you see pictured. She of course sets out the standard approach only to muddle the clear binaries. As Mermedonia is an island that looks much like Britain, and since Andrew’s mission seems to be as much one of conquest as it is one of conversion, we might say Andrew’s gone a-Viking and the Mermedonians are his victims (25). The Mermedonian costume and military organization should themselves be uncannily familiar to the tenth-century English. And Andrew himself is someone who eats human flesh and drinks human blood: he’s a Christian after all, and it had recently become de rigeur to demand that the Eucharist be understood as the real body of Christ. Blurton aims at doing a “contrapuntal reading” (see Said Culture and Imperialism) that “creates a counterpoint between a dominant cultural discourse and a resisting perspective, which opens up a new space for meaning” (18); in this case, “Reading Andreas contrapuntally uncovers what I refer to as its cannibal narrative, that is, a narrative that is sympathetic to the cannibal Mermedonians” (18). I would like to think that if I weren’t suffering from a days’-long headcold, I could draw all this together. For now, I want only to observe that when the father saves himself by offering up his son to be eaten, any response that saw this only as monstrous would be self-congratulatory. But more likely, the response would have been the shock of the familiar, the shuddering memory of what horrors famines cause (on their frequency, and thus familiarity, see the list in P. Bonnassie “Consommation d’aliments immondes et cannibalisme de survie dans l’Occident du haut Moyen Age.” Annales 44 (1989): 1035-56, at 1045: there were 29 major famines between 751 and 1100), and shared sorrow. For a time, the readers of Andreas would have felt for and with the Mermedonians. 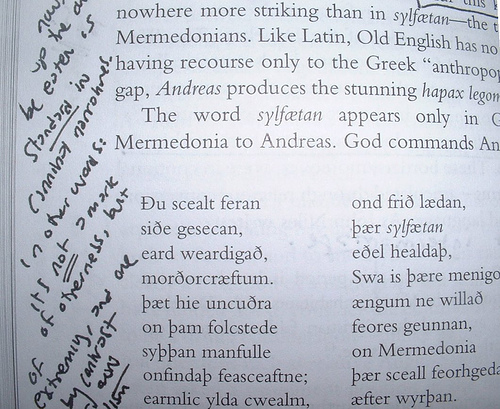 This entry was posted in Book Reviews, MedievalBlog and tagged anthropophagy, heather blurton, Mermedonians, Old English Andreas by medievalkarl. Bookmark the permalink.